A couple years ago I gave up on store bought bread and started making my own because I wanted something I liked and didn’t cost a small fortune. I found a recipe that worked for me and over time I refined it until I had something that was just about perfect. Of course, I can’t leave well enough alone, so I tried an experiment: Bacon bread. Oh, yes. Start with the egg in a measuring cup and add warm water to make 1 1/3 cups of liquid. The water and egg mixture goes into the bread maker pan, and then add the brown sugar, salt, and olive oil. Gently add the flour so it makes a layer above the liquid, then add the vital wheat gluten and yeast. If you have a wheat bread setting on your bread maker, use that. If you have a light crust setting, go with that, too. If your dough feels too dry as it’s mixing, add a tablespoon or so of water. You want your dough to feel tacky but not too sticky. Too dry is also bad. Now for my bacon variation: Just cook up some bacon in a skillet and use the left over grease in place of the olive oil. You need to let it cool some ahead of time, otherwise it’ll make the egg kind of clotty and may raise the overall temperature too much for the yeast. Also, be ready to add an extra tablespoon or two of flour. I found that my bacon dough was way too gooey, so I had to toss in a little extra flour while it was mixing. Once your bread finishes baking let it sit on a cooling rack for about an hour before you even think about cutting it. I know this sounds practically impossible, but trust me. Your bread is still cooking and needs time to finish doing its thing before you slice it up. And for my vegan friends: Skip the egg and go with just water. Most people won’t have any idea that you did and your bread is animal-free. It’s up to you if you want to consider bacon grease vegan-safe. 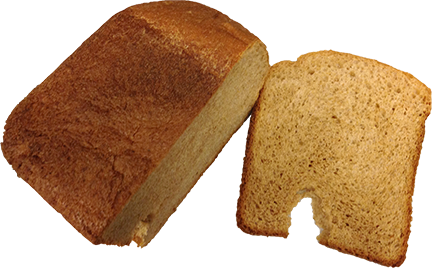 Your bread won’t taste like bacon loaf, but has a slightly softer and more elastic feel than my regular bread. Plus, you have a great excuse to make some bacon. OK, gang, fire up your bread makers! This entry was posted in Personal by jeff. Bookmark the permalink.